From virtual reality to NASA’s artist-in-residence, full-body motion tracking, livestreamed 360-degree video, projection mapping, artificial intelligence and virtual reality, change-maker Chris Denson, will explore the intersection of arts and technology and discuss how tech entrepreneurs, creatives and artists can develop new means of creative expression and amplify the creative ecosystem. Chris Denson is the creator of the Innovation Crush podcast profiling some of the world’s most daring projects from marketing ideas to technology innovations and more to 750,000+ followers. He is also Director of Omnicom Media Group’s Ignition Factory, the key group responsible for emerging innovations across media, technology, and culture. 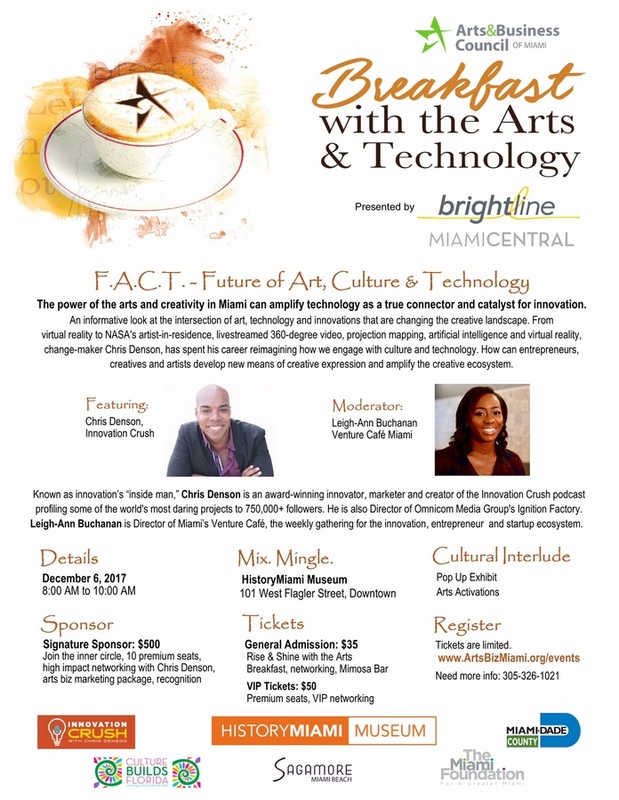 Leigh-Ann Buchanan is Director of Miami’s Venture Café. The Thursday Gathering is Miami’s largest weekly gathering for the innovation, entrepreneur and startup ecosystem.